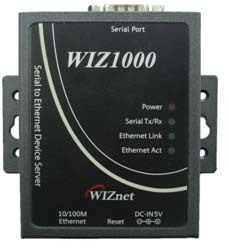 WIZ1000 | WIZnet Co., Ltd.
WIZ1000 is an external device server that performs “Serial to Ethernet” function. 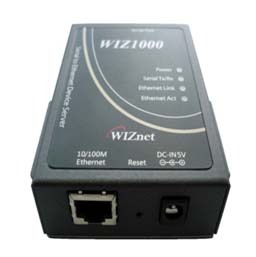 WIZ1000 is the protocol converter that transmits the data sent by serial equipment as TCP/IP data type, and converts back the TCP/IP data received through the network into serial data to transmit back to the equipment. Just by connecting LAN & Serial cable to the device, you can easily add the ‘Serial to Ethernet’ function.